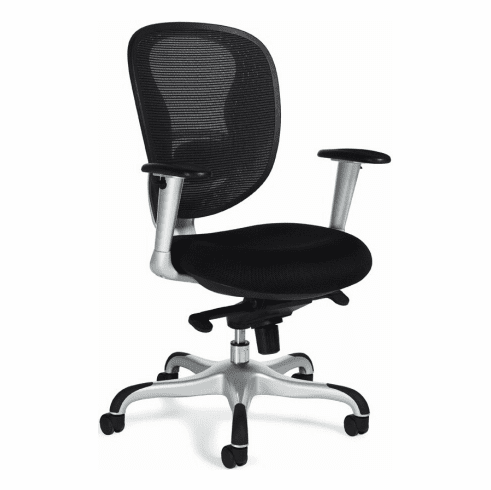 OTG™ Contemporary Mesh Office Chair  with Free Shipping! This ergonomic mesh office chair from Offices to Go features an attractive contemporary design with titanium finish arm and base accents. Other features include a soft screen mesh backrest, breathable mesh fabric seat with thick foam padding for added comfort, synchro knee tilt control for a more relaxed recline, multi-position tilt lock with tilt tension adjustment, adjustable lumbar support, pneumatic seat height adjustment, 360-degree swivel, height adjustable arms with polyurethane armrests and a heavy duty five star spider base with anti-scuff tips and twin wheel carpet casters. Optional headrest available also available for this model. Meets or exceeds ANSI/BIFMA standards. Dimensions: Seat Size: 20.5"W x 18"D. Back Size: 19"W x 21"H. Seat Height: 17.5" - 21.5"H. Overall: 41.5"H x 26"W x 25"D. Five year limited warranty from Offices to Go. This chair normally ships within 1-2 business days.